This year’s Young Patriots scholarship essay contest received hundreds of excellent entries, and the competition was fierce! After much deliberation, our judges have selected the three winning entries. Click the links above to read each winning essay! 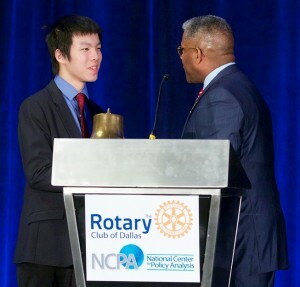 Kevin receiving his award at a special luncheon, held February 4, 2015. Thank you to everyone who submitted essays to the contest– this year’s entries were the best yet, and the decision was very difficult. If your submission was not selected this year, we encourage you to try again next year. The 2015-2016 contest will open this fall. Hi how can other candidats find out their result?